Federal guidance reports are used by federal and state agencies in developing radiation protection regulations and standards to protect the American public from harmful effects of radiation. The United States Environmental Protection Agency’s federal guidance reports that are classified as technical reports provide current scientific and technical information of performing radiation dose and risk assessments. Federal and state agencies use the information in these reports in the development and implementation of radiation protection regulations and standards while regulated organizations and companies use them to demonstrate regulatory compliance. 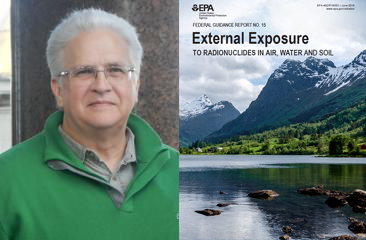 Federal Guidance Report 15 (External Exposure to Radionuclides in Air, Water and Soil) is an updated and expanded version of the 1993 Federal Guidance Report No. 12. It provides effective dose rate coefficients for 1,252 radionuclides and six different age groups with updated dose quantity definitions, radionuclide decay, and more powerful computation software for external exposure to radionuclides distributed in air, water or soil. The data and the report were generated by the Center for Radiation Protection Knowledge in the Environmental Sciences Division at Oak Ridge National Laboratory. Dr. Hertel participated in the preparation of this report as part of his Joint Faculty Appointment at the CRPK. Co-authors include Georgia Tech Alumni Michael B. Bellamy, Shaheen A. Dewji, Ken Veinot, and Ryan Manger.